Scotland's finance secretary has said he will not pass on a tax break for higher earners that was announced by the chancellor in his UK budget. 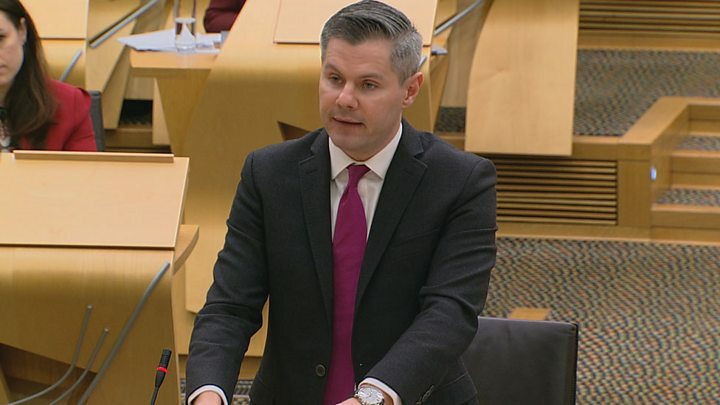 Derek Mackay said "now is not the time" to cut taxes for higher rate tax payers as he unveiled his Scottish budget. It means the gap between how much higher earners in Scotland pay has widened compared to the rest of the UK. But Mr Mackay said most people would continue to pay less in Scotland than south of the border. He also pledged extra funding for education, the health service, local government and infrastructure as he set out his plans for tax and spending for the next year at Holyrood. The Conservatives claimed that higher earners were "being punished in the SNP's Scotland," with people earning £50,000 in Scotland paying about £1,500 more a year than their counterparts south of the border. How does tax compare with the rest of the UK? The Tories also said people earning £40,000 in Scotland would be £130 a year worse off than their equivalents elsewhere in the UK, increasing to a gap of nearly £500 a year for those on £45,000. The proposals mean that everyone earning under £27,000 in Scotland - about 55% of taxpayers - would pay less income tax than those on the same salary elsewhere in the UK. But they would only be a maximum of just over £20 a year better off, according to economists at the Fraser of Allander Institute. Mr Mackay also said everyone earning under about £124,000 in Scotland would pay less tax than they did last year. Mr Mackay said his budget "prepares our economy for the opportunity of the future, enables the transformation of essential public services, and builds a more inclusive and just society". The finance secretary warned that he "may be required to revisit the priorities in this budget" if the UK leaves the EU without a deal, saying that "significant resources" had already been diverted to prepare for Brexit. On income tax, Mr Mackay opted to raise the threshold where the lowest rates kick in by the rate of inflation, and froze the point at which people start paying the higher rate at £43,430. This means almost every tax payer in Scotland will pay no more tax next year than in the current financial year. However, with Chancellor Philip Hammond announcing in October that the higher rate threshold in the rest of the UK would rise to £50,000, it meant the gap between what higher earners pay in tax north and south of the border would grow. Mr Mackay insisted that "now is not the time to cut tax for the highest earners at the expense of our public services". He said freezing the higher rate threshold - paid by the top 15% of taxpayers in Scotland - was forecast to deliver an extra £68m for public services. Wednesday's announcement is the first step in the budget process, which will see MSPs vote on the budget bill for the first time at the end of January. Mr Mackay needs to win the backing of at least one opposition party to get his plans through parliament, but little progress has been made in negotiations so far. Opposition party members raised a series of concerns with Mr Mackay following his announcement. What are opposition parties saying? For the Conservatives, Murdo Fraser said there was "no requirement for tax rises" when extra money was being sent to Holyrood from Westminster in light of spending increases south of the border. Labour's James Kelly said the budget was "timid" and had failed to support public services which are at "breaking point". Green co-convener Patrick Harvie challenged Mr Mackay over local government finance reform, while Lib Dem leader Willie Rennie urged the SNP to distance themselves from plans for a second independence referendum.